Your time is precious. Spend it at a meeting, not by looking for one. Display your meeting room reservations directly at the meeting room door. 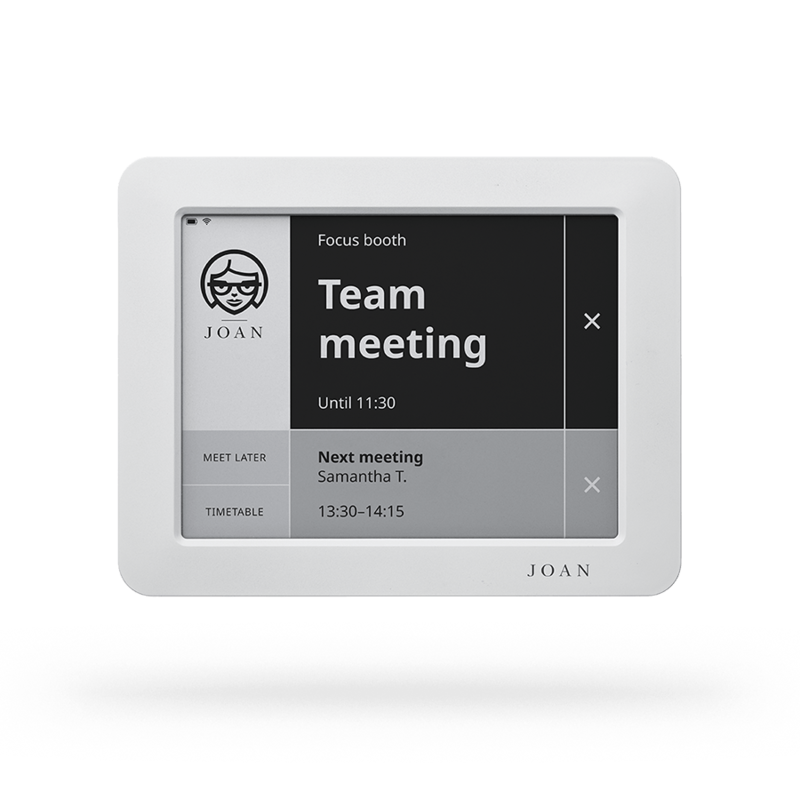 Schedule a meeting from your phone, computer, or from your device and watch Joan’s screen change in real time. 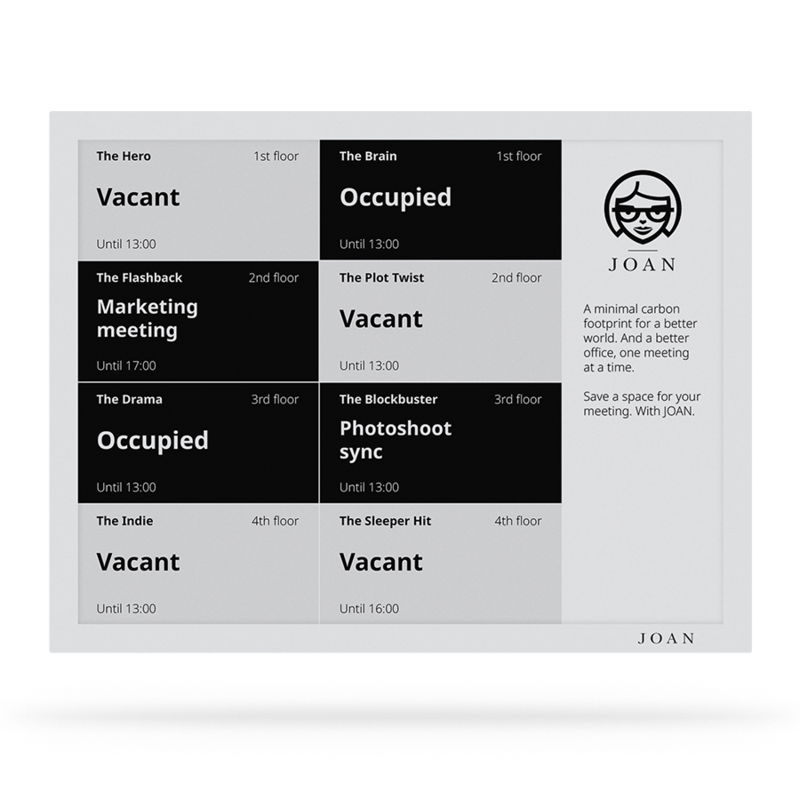 Joan works in tandem with existing calendar solutions. For small meeting rooms and office spaces. For large conference rooms and boardrooms. For office receptions and lobbies. Show your corporate branding and upload your company logo, which can be set to appear across all of your devices. Select your language* (maybe Klingon if you're feeling stellar) and tailor Joan to your needs. English, German, French, Italian, Spanish, Portuguese, Finnish, Polish, Icelandic, Norwegian, Danish, Dutch, Lithuanian, Czech, Russian, Slovak, Slovenian, Swedish, and Klingon, and new languages coming every month. What is the difference between Joan Manager and Joan Executive? The Joan Manager device supports WPA2-PSK encryption, whereas Joan Executive supports Enterprise WPA2-EAP encryption. Both are 802.1x supported. 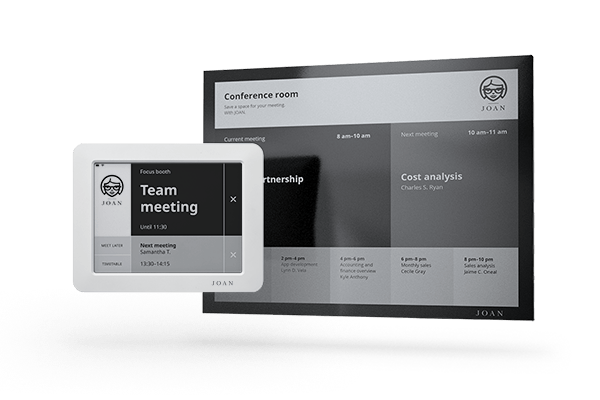 The Joan Executive device also offers space usage reports with advanced meeting analytics. How do I charge my Joan device? Joan is powered by a high-performance rechargeable 5400mAh Lithium­-Polymer battery that needs recharging once every couple of weeks. You can either use the enclosed Micro-USB cable or use a certified Micro-USB charger with an output rating of 5 V, 1A max. The power must be supplied from an external power supply source that complies with the requirements for Limited power source. Can I keep Joan permanently connected to a power source? Sure thing! Just make sure that the charger you are using is a certified Micro USB charger with an output rating of 5 V, 1 A max. Joan has an inbuilt battery, which allows for its cableless operation, but if you want to connect Joan directly to a power source, go ahead. This way you won't have to charge your Joan devices. Does Joan work with my personal calendar? Joan connects to Google (G Suite, Google Calendar), Office 365 (Exchange Online), Microsoft Exchange (Outlook), iCalendar (.ics) and CollegeNET's 25Live. Does Joan need a constant Wi-Fi connection? To be able to connect to its server, Joan needs a strong, stable Wi-Fi connection. If the signal drops frequently, this will influence Joan’s performance and battery life. With a network that’s overcrowded by too many clients and access points and a lot of interference, Joan might have trouble ensuring smooth operation. Joan is a thin client device, which means that all of its operations take place online. The device itself does not store any calendar data and no calendar events are permanently stored on our servers. The only data stored on the device is the data required to connect the Joan devices to your Wi-Fi network. Is my data private and safe? How is Joan attached to the door or wall? Because the device has no cables whatsoever, installation is a simple matter of peeling the foil off the adhesive Magnetic Mount and attaching Joan to the wall or door. Joan can be attached to any surface without drilling or the need for a heavy, costly installation. You can fix JOAN on any firm surface you want; glass, wood or brick, it will stick. As long as your chosen spot is clean, isn’t uneven or bumpy and your plaster isn’t peeling or flaking off due to a number of repaints, you’re good to go. How does cloud hosting work? Can I cancel my subscription? We offer a cloud hosting option for the fastest and most hassle-free out-of-the-box experience for our customers that might not have dedicated in-house IT. This means that you don’t have to worry about server setup and maintenance. 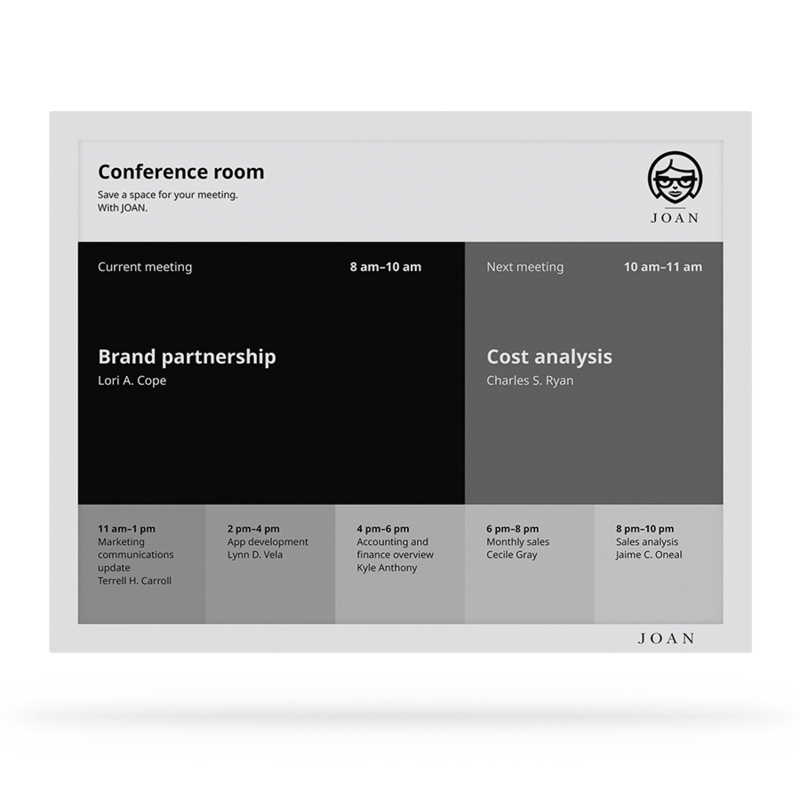 All you have to do is connect your Joan device with the calendar solution your organization is using, and we’ll take care of the rest, making sure you always have the best Joan experience. A monthly price of €8.99 per Joan Manager or Joan Executive is charged to host Joan on our server infrastructure in the cloud, whereas the cloud hosting for Joan Board, Joan Premium and Joan Classroom is €14.99 per device. The Joan Store accepts payment via PayPal and most major credit cards such as Visa®, MasterCard®, and American Express®. All credit card information you provide to our server is fully encrypted and secure. If you prefer to pay via a direct bank transfer, contact us at [email protected] and we’ll forward a quote to you.